Jordan Brand is set to release another impressive cross-trainer shoe this December and it is expected to turn a lot of heads this month. 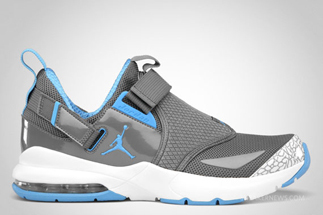 As part of the Jordan Brand Holiday Collection 2011, the Jordan Trunner LX 11 will be released in Jordan Trunner LX 11 Cool Grey/University Blue – White colourway anytime this month. The silhouette features cool grey accents on the upper part with elephant print pattern on the heel accented with touches of university blue on the lining, branding, and outsole. This one looks simple but you won’t regret buying this sneaker!